As I was eating breakfast my mind drifted back to the Doppelbock I had at Alesmith the night before, Decadence 2013. My mental notes were simple, one of the best Doppelbock’s I’ve ever tasted. If true it seemed a pity to go home with only a 4-ounce taster that was a blur amongst all of the other beers we tasted on Saturday night. 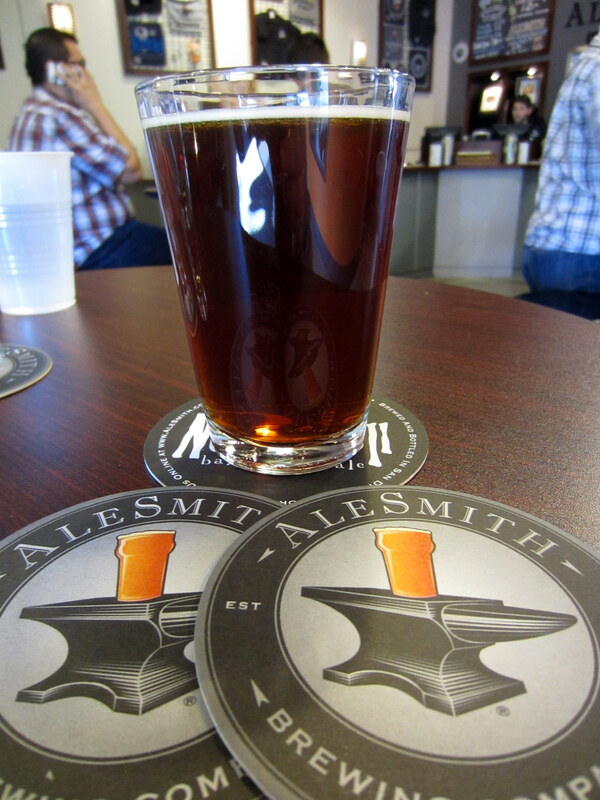 So we headed back to Alesmith to start day two. This time I had an 8-oz glass on a fresh palate. After a second try I would stand by my assessment from the night before, but the beer is so rich that an eight ounce pour was just about the right size (click here to see full review). Alpine Beer Company was high on my list of places to visit in San Diego. While they are known for making excellent hoppy beers (Nelson, Duet, Pure Hoppiness, and others), the downside is their isolated location, 3o some miles east of San Diego up in the mountains, which kept Alpine off the original itinerary. Now that we were looking at a more relaxed schedule we decided to head up to the mountains for some lunch and tasters of their renowned IPAs. 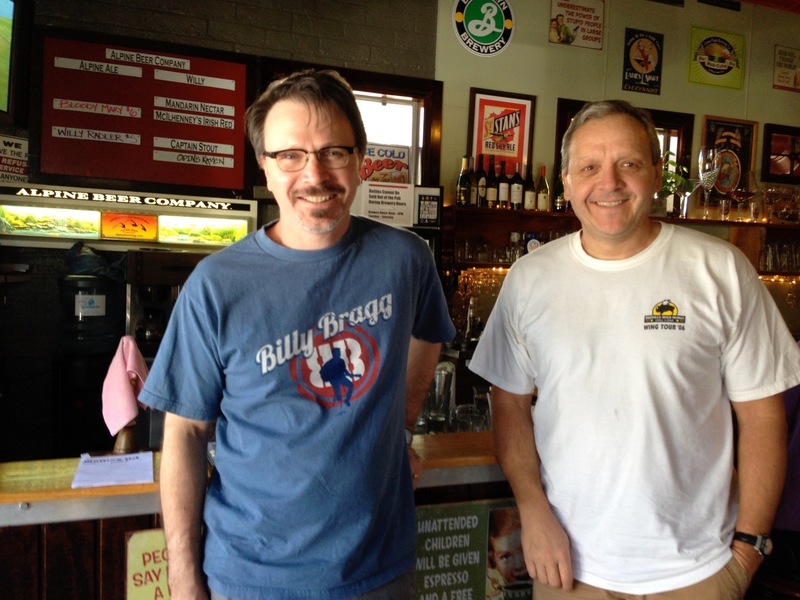 On Sundays the brewery is closed, but their brewpub is open. Unfortunately, we were in for a big disappointment because they were sold out of every pale ale, IPA, DIPA they brew. Apparently there had been a special release of their DIPA Exponential Hoppiness two days earlier, which drew a big crowd (30+ people waiting in line to get in we were told) and this had completely cleaned them out. The bartenders said this was the first time this had ever happened, talk about bad timing! What can you do? We made the best of it and had a four beer taster flight (if you blow up the picture below you can see that they only had five beers on tap). Their Irish Red Ale is pretty good and they did have their seasonal Imperial Stout, Odin’s Raven on tap. The pub has the feel of a western roadhouse bar and would not be out of place in the mountains of my native Idaho. The bartenders were nice and apologetic about their shortage of beer. The food menu was basic pub-fare, but my pulled pork sandwich hit the spot. At the end of the day going up to Alpine is a long way from anything else, 35-45 minutes each way. I’m not in a position to say whether it is worth the drive when they have their full selection on tap, I’ve read posts that say it is THE place to go in San Diego, but for us it was the biggest disappointment of the trip. I would at least recommend calling ahead. Throwing our original itinerary completely out we decided to head into San Diego proper to visit Modern Times Brewing. I had read a short piece in Draft magazine that made it sound like an interesting place to visit, plus they were picked by RateBeer as one of the top 10 new breweries in the world in 2013. I will say that the space did not disappoint. It’s located in a large warehouse with 20′-30’ ceilings. 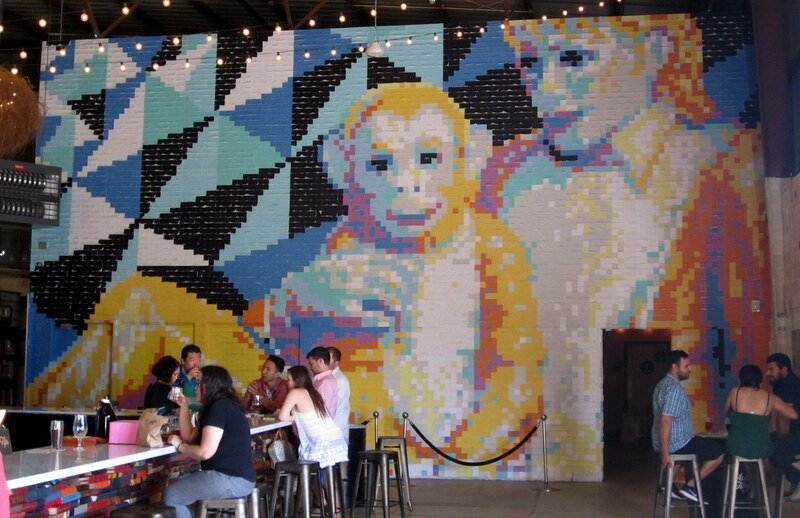 When you walk in the first thing that catches your eye is a huge post-it note mosaic of Michael Jackson and his monkey, Bubbles. 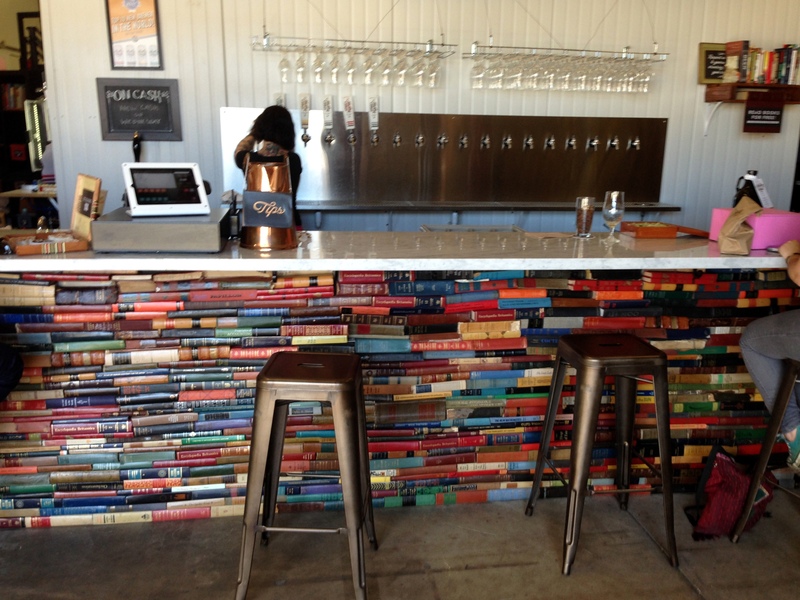 That’s not the only eye-catching feature of the brewery: the opposite wall is covered in comic book pages with a large Modern Times logo superimposed; the bar sits in the middle of the warehouse and consists of a marble counter top supported completely by old books; the overhead lights are ensconced in tumble weeds. It was easily the most visually striking space we visited. Although their website says they have up to 16 beers on tap, there were only 5 beers on tap when we visited. We each ordered a flight of their core beers (Lomaland Saison, Fortunate Islands Hoppy Wheat, Black House Coffee Stout, and Blazing World Hoppy Amber). They were all good beers, but the only one that stood out for me was the Lomaland Saison, maybe that was because it was my first Saison of the trip having said that, neither Hoppy Wheat beers nor Amber Ales are among my favorite styles. In the end I thought the beers here were good, but not exceptional. I probably need to give it another try to say for sure. Better yet if you are in San Diego why don’t you stop in and see for yourself. 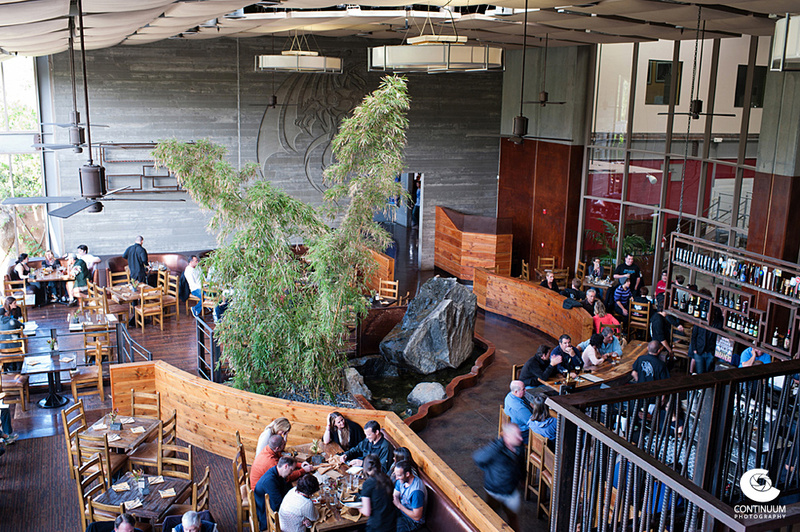 It’s worth a visit just to see the brewery and hang out in this cool space. Our next stop was the only non-brewery we visited on the trip. Fathom is a tiny bar/bistro located on a pier that juts into the San Diego harbor from Shelter Island. 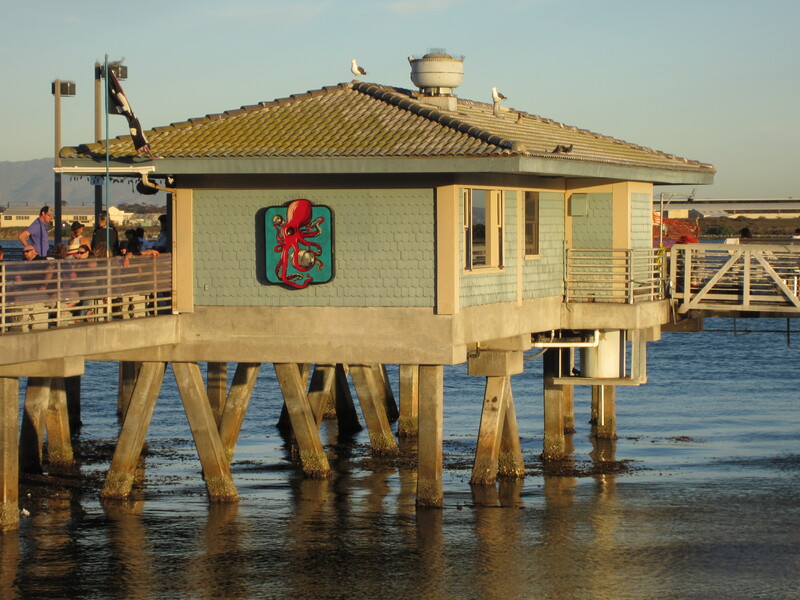 In addition to being a quirky little bar it also sells bait and tackle to people who come to the pier for fishing. 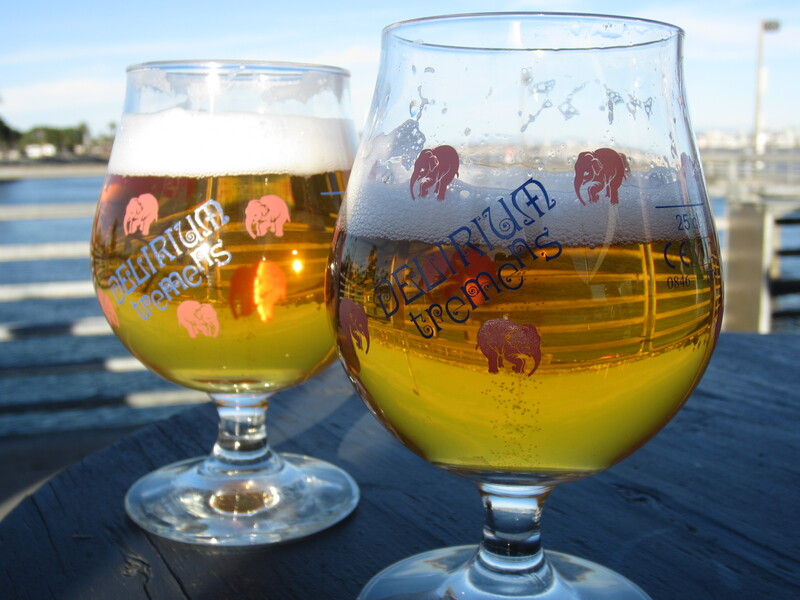 Their tap list consists of 15 or so beers ranging from local favorites, to beers from elsewhere in the country (mostly Northern California), and a few Belgian imports. I read in Draft magazine that the owner used to be roommates with Vinnie Cilurzo, head honcho at Russian River brewing, but there were no Russian River beers on tap the day we visited. The best thing is the view across the harbor looking at downtown San Diego, perfect for a sunny late Sunday afternoon. Seats are pretty limited though, so we ended up standing around an old wooden barrel in a small roped off area on the pier, but after enduring what seems like 16 months of cold Ohio winter we weren’t complaining. Sticking with the drink local theme Tom and I both ordered The Harlot, a Belgian-style ale made by Societe Brewing, which was our intended but never realized last stop of the previous night. Both in online forums and speaking to people in person, there seems to be two schools of thought surrounding Societe. Some people describe it as a can’t-miss stop on the San Diego beer circuit, while others felt it was seriously overrated. For my part I can say that The Harlot is a very good Saison-style ale. I thought it was better than Lomaland Saison, and one of the better beers I had on the trip. Based on our original itinerary I had booked a hotel up in Vista for the night. So after leaving Fathom we drove 45 minutes or so up the coast to our hotel and checked in. It was near 7 pm by now and most of the breweries close at 5-6 pm on a Sunday, which means we missed our chance to hit Lost Abbey or any of the smaller breweries in the San Marcos/Vista area (Riptide, Belching Beaver, Latitude 33, Iron Fist, …), which was OK because our stamina was fading. We decided to recharge our batteries, both literally and figuratively, before heading over to Stone for dinner and a night cap. The first thing that strikes you about Stone is the sheer size of the place. All of the other breweries we visited would probably fit into the parking lot at the Stone World Bistro and Gardens in Escondido. Inside there is a gift shop, a large production area for brewing, that is separated from a rather large restaurant area by a 25’ high glass wall. 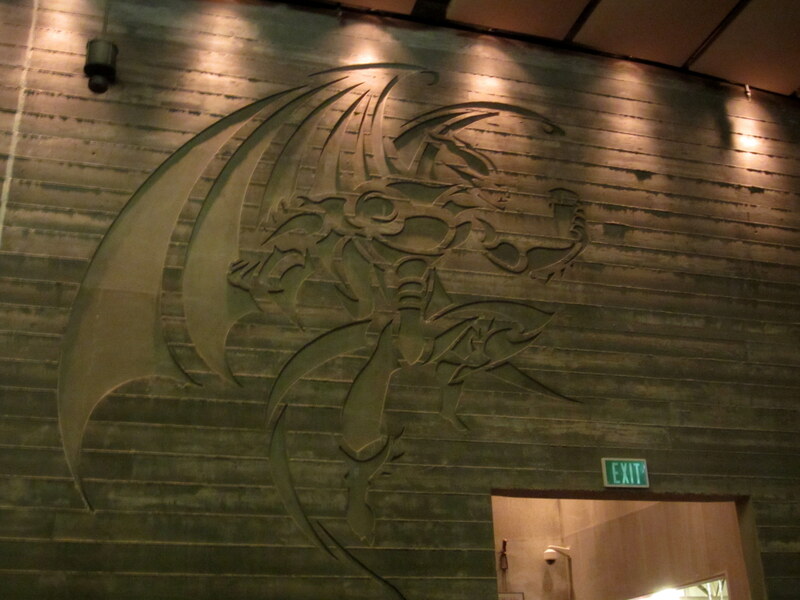 There is a spacious outdoor patio with a fire pit, and a bar that sits between the restaurant and the brewing vats. There are waterfalls and ponds with goldfish, everything is decorated with stone, appropriately enough (see photo below taken from the web, we were sitting just behind the big tree). It’s on a completely different scale than anywhere else we visited, a little over the top in my humble opinion. Although the beer list is pretty extensive there was not much that I couldn’t buy in Columbus. I guess that is a testament to Stone’s distribution network. Keeping with the Saison theme I had a Matt’s Burning Rosids, an Imperial Saison. I wasn’t sure how the cherrywood smoked malt flavors would play with the spicy Saison yeast byproducts, but my concerns were ill-founded. This is an unusual and tasty beer that would be worth picking up back home. The food in the restaurant tends toward being upscale ($15-$25) with an emphasis on fresh ingredients, some of which are grown on-site. Of all the places we visited Stone had the best food hands down. So if you can try to plan your stop at Stone around either lunch or dinner. However, bear in mind that the service is not particularly fast. I said that most of the tap list is available in Columbus, but there were a few exceptions. Both Blind Pig IPA and Pliny the Elder were available. So to finish the day, ten hours after we started, Tom had a Blind Pig and I had a Pliny. Not a bad way to wrap things up. That was it for our tour of San Diego breweries, and the official “beercation”. However, I did get a chance to visit two LA breweries in the evenings during the rest of my trip. If you liked this post check out the other three days of my trip.